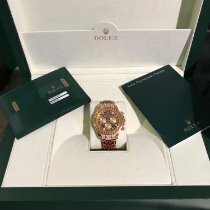 (When comparing this watch with others, please make sure you are comparing factory accessories and not aftermarket or "applied" accessories like diamond bezels, dials or straps. There are many watches out there that look like this but are not Rolex original, they have added features to look like the original). 18K 40mm Gold Case With 8 Diamonds Set On A Leopard Dial With 3 Classic Sub Dials. CIRCA 2005.Cal. 4130 automatic, 44 jewels, leopard-print dial, 30 minute and 12 hour registers, tonneau-shaped water-resistant-type case, screw back, screw down crown, two round screw down chronograph buttons in the band, 18k gold Rolex deployant clasp, case, dial and movement signed.38.5 mm. diam.